Herein, we report a concise enantioselective synthesis of (–)-allosecurinine, a tetracyclic Securinega alkaloid featuring an α,β-unsaturated γ-lactone moiety. 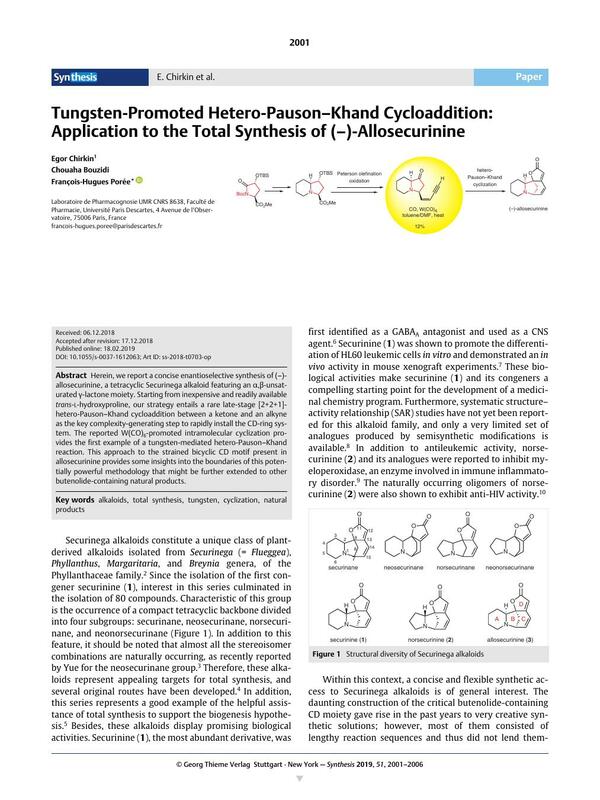 Starting from inexpensive and readily available trans-l-hydroxyproline, our strategy entails a rare late-stage [2+2+1]-hetero-Pauson–Khand cycloaddition between a ketone and an alkyne as the key complexity-generating step to rapidly install the CD-ring system. The reported W(CO)6-promoted intramolecular cyclization provides the first example of a tungsten-mediated hetero-Pauson–Khand reaction. This approach to the strained bicyclic CD motif present in ­allosecurinine provides some insights into the boundaries of this potentially powerful methodology that might be further extended to other butenolide-containing natural products. Supporting information for this article is available online at https://doi.org/10.1055/s-0037-1612063. 1 Present address: CEA IBiTec-S/SCBM, CEA Saclay, Labex LERMIT, 91191 Gif-sur-Yvette, France.